Parfum feminin floral cu note intense de iasomie. Parfum concentrat pe baza de ulei, de inalta calitate, nu contine alcool si confera persistenta indelungata.Sticla este prevazuta cu sistem roll-on. Smells just like Jasmine and has a deep and sensual scent. A powerful floral scent, that is fresh and clean, a true Jasmine flower fragrance. This fantastic perfume oil is high quality, long lasting and is free from ethyl alcohol, a little of this exquisite fragrance goes a long way. Jasmine is one of the most prominent scents and has a unique and incredibly intense aroma, the synthetic and pure jasmine scent is used in many high grade perfume blends. The fragrance of jasmine has rejuvenating, boosting and energizing properties, which makes it a superb mind-blowing fragrance, one of the most prominent scents and it has highly unique and incredibly intense aroma. The Jasmine scent is a unique and enthusiastic aroma. 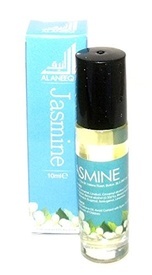 Pure Jasmine essential oil comes next to rose in order of importance in the perfume world.